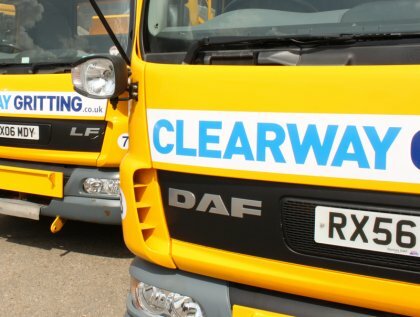 Clearway Gritting, one of the leading road gritting companies in Hertfordshire. Clearway Gritting, one of the leading road gritting companies in Hertfordshire, has had an impressive start to the winter season. To date, the road gritting activity has far surpassed the previous season with regards to the number of sites that have benefited from their gritting services. There is, however, more caution required for the remainder of the Winter Season. Whilst the weather may appear very cold and dry, Facility Managers should still be acutely aware of any standing water their sites may have in the form of puddles, leaks or run offs. These particular areas can easily freeze and ice over rapidly and may also be covered in light snow which can mask the ice underneath. This can catch people unawares causing a much higher risk of slipping. We have invested in a new vehicle tracking system, which has proven to be highly effective in supporting our daily road and car park gritting activities. It has shown to be extremely accurate and, with feedback requests from our existing customers, has been able to provide instant information and site imagery reports to show where the vehicles have been. This has been particularly impressive when unexpected requests for additional areas to be gritted arrived. The customer’s subsequent feedback was extremely complimentary about the high level of customer service they received. We take pride in providing an unrivalled gritting service to our clients. By using the Met Office Open Road forecasting system, we are able to take a proactive approach when communicating and scheduling the road gritting for all of our clients. We are often asked questions with regards to our proactive approach and how we determine the temperatures in our reports. The answer is quite straight forward; we use the Met Office Open Site forecast that measures the road surface temperature (RST) as opposed to the air temperature. These may differ by as much as 3 degrees Celsius, we therefore use the Minimum RST as a base for our road and car park gritting schedule. This is a safer and more accurate approach, which in turns helps us to ensure we provide the excellent service we pride ourselves on. In addition to our proactive approach, we understand that there are, on occasion, times that a more reactive service is required. We are a gritting company that has built in flexibility and can react promptly to emergency gritting requests. We have seen this season a number of occasions where this ability has been called upon, deploying a complete service in the morning where the request has come in. We are pleased to have helped a number of major NHS Hospitals and other High Priority sites across Hertfordshire, ensuring their businesses remain operational during poor weather conditions.